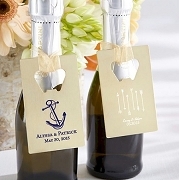 These Starfish Design Bottle Opener Favors are sure to play a starring role as elegant and useful beach themed favors. Planning a destination wedding or a wedding/special event with a beach theme? Well, whether you’re going to actually be oceanside or just want to give your event some beachfront flair, these starfish favors are certainly a great catch! 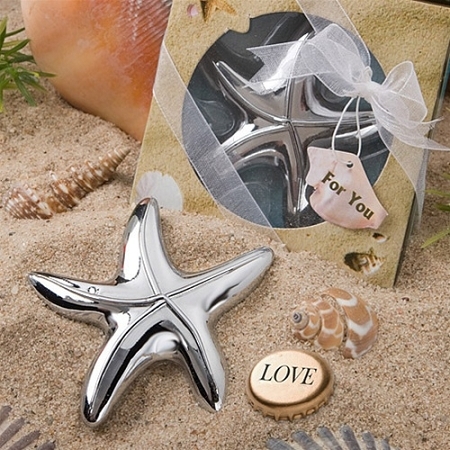 Each shiny silver metal chrome-finished bottle opener favor measures 3" x 3", in the shape of a five pointed starfish with a useful bottle opener tucked in the underside. Each starfish favor comes packaged in a beach themed box with a detailed sand and shell design and a clear round window center for viewing. The box has ocean color sides and inside and is tied with a white organza ribbon and an attached shell shaped For You tag. Love these bottle openers. 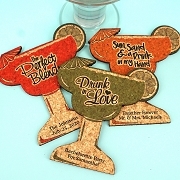 They are great quality and look adorable if you incorporate them in a tablescape or other type of decor. 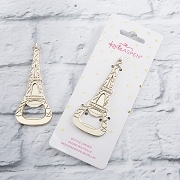 They are a little smaller than I initially thought but they function perfectly as a bottle opener. Definitely recommend. Was nervous about shopping online but glad I did, I saved money and the service was great. Thank you. The item was a great price and arrived very quickly. Everything was just as expected, and those receiving the gifts loved them! 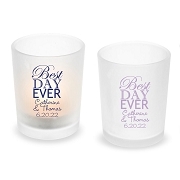 Wow we were amazed on how sturdy these Favors are. We used them as part of our decoration for our tables and did put enough on there so every guest can take one home. They were fun and beautiful, everybody loved them.